Light: Refusing to be silenced through fear or intimidation. Continuing a fight against all odds. Being fierce. Defending yourself against physical and emotional attacks. Refusing to put up with abuse. Clinging to your values despite all pressure to abandon them. Shadow: Having a chip on your shoulder. Taking unnecessary risks as a means of proving your fearlessness. Looking for an opportunity to take offense. Responding to constructive criticism with defensiveness. Refusing to stand up for yourself and your beliefs. Story: The Main Character is attacked by the minions of his adversary. Relationships. In a healthy relationship, each person feels secure. Partners and friends who constantly abuse others or tear people down must be confronted. Being in a relationship does not mean squelching your own unique insights; stand up for what you feel is right. Work. The workplace tends to reward aggression. Defend yourself and your own work, making sure you have hard data to back up your claims. If you must become involved in unpleasantness, be sure those you investigate have no valid reason to feel attacked. Spirituality. Especially when you feel attacked, your spirituality should guide you. Don’t be defensive; as a spiritual person, you know it’s “not about you.” As dramas unfold, stand up for your beliefs, but avoid absorbing and reflecting the poisonous emotions of others. Personal Growth. Standing up for yourself is healthy and reasonable. Turning the other cheek doesn’t mean making yourself into a doormat. It’s okay to insist on respect. Apply this principle to your interactions with others, too; it’s easier to get fair treatment when you’re known for treating others fairly. Fortune Telling. Don’t be surprised by a personal attack. Prepare to defend yourself or someone you love. When? Between August 12th and 22nd. Six Converging Wands. 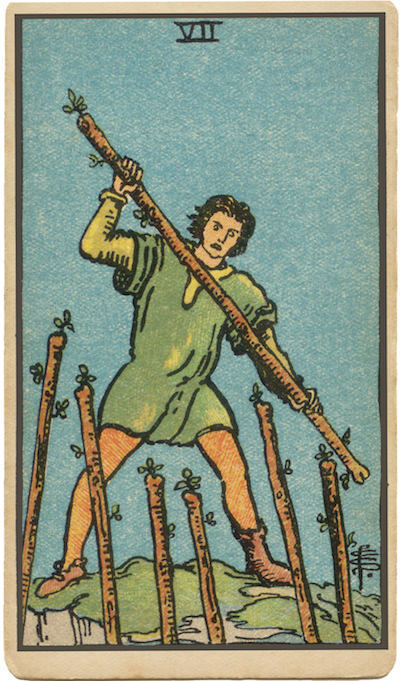 On RWS-inspired decks, we often see a lone figure threatened by six converging Wands. Six is the number of collaboration, suggesting that many people have come together to launch an attack. But who is carrying those wands? Is the attack real…or imagined? The King of the Hill. Many illustrations for this card place the lone warrior on top of a small hill cliff. Is our friend a guard? If so, what is he guarding? And, more importantly, is it worth fighting for? Crisis as a Clarifier. A crisis has the power to reveal what we really value. In your situation, how far are you willing to go to stand up for what you believe in? The Marseilles Image. Again, a lone wand comes to shatter the arrangement we worked so hard to establish! The lattice we built for the Six collapses. Why would someone do this? How can we prevent it from happening? And are these, in the end, the questions we should be asking? When do you feel most threatened? When do you get defensive? How capable are you of defending yourself? What kinds of beliefs are worth defending?